We can't believe it, but SEVENTYyears ago, "Big John" Livaditis was contacted at his Zesto Drive-In on Peachtree Road (across from Brookwood Station) by a Christmas tree grower who offered him a sum of money to sell Christmas trees on his Zesto property. John saw an opportunity to create another business in Atlanta and decided, "I'm going into the Christmas tree business!" John may not have known that his Christmas tree business would grow to become Atlanta's Standard Bearer, but one thing was true - everyone knew that Big John had the very best trees! His sons, Lee and Jimbo, after years of mentoring by Big John, became the next generation of "Bigs" to carry on the family-run tradition. Today, Jimbo's family runs the business and his kids are the third generation of Livaditis' actively involved. Many family members and friends have worked with Big John's for years, some even decades, to create the Atlanta institution that now celebrates it's 70th year! Like Big John before him, Jimbo personally visits the very best growers and horticulturists in the US and Canada (three National and State Grand Champion growers), continuing Big John's tradition of "hand-picking" your tree and special select wreaths and roping. By visiting our growers (some of whom we've bought from for close to 50 years) and hands-on inspection and selection, we can ensure that you're getting the freshest and very best trees and greenery available. To guarantee this quality, we have two simple rules: to harvest product as late as possible, and to handle and maintain our products so as to preserve their freshness, structure and keepability. Additionally, fresh trees and greenery are brought in almost daily to give you the best selection possible. Perhaps the unsurpassed beauty of our trees and specialty greenery is why Big John's is the choice of Atlanta's most well-known professional decorators and designers (as well as the most discerning families and kids!). And our unsurpassed selection of Specials and Old-Fashioned trees (the hand-picked of the hand-picked, the cream-of-the-crop, etc. etc., for balance, symmetry, proportion, texture, color and what we call triangularity and decoratability)—well, you've just got to see them to appreciate them! 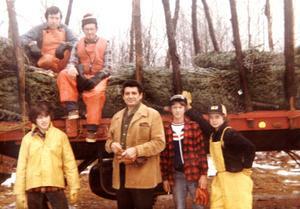 Adding to Big John's vision of having the best selection of fresh, premium trees was his commitment to service. Your visit will be marked by our attentive, caring and knowledgeable professionals who seek to understand your needs and expectations and are committed to a Total Quality buying experience. As always, your tree is fresh cut, "gift-wrapped," mounted in your stand if needed, and loaded in or on your vehicle, with our compliments. Our managers will even make selections on your behalf if your time is short. Our experienced tree-lighting crew can carefully wrap the branches of your tree with the highest quality lights and our professional Just in the Time of Nick Delivery Service in-home delivery and installation service round out the "Big John's Christmas Trees Experience." One of Big John's quiet legacies was his commitment to the community. We are a proud sponsor of local schools and charitable institutions in the stewardship spirit of giving back to our neighborhoods, our communities, and those in need—we hope you have time to do the same. As always, your continued trust and patronage is appreciated, and we look forward to seeing you soon in this, our 70th year in Atlanta!